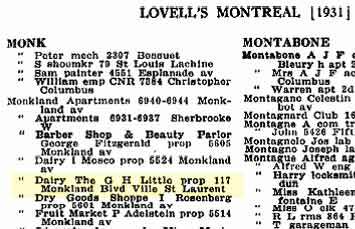 In the Montreal Lovell's, from 1931 to 1934 the Monkland Dairy was situated 117 Monkland Blvd Ville St-Laurent and the owner shown is G.H. Little. After the year 1934-35, the Monkland Dairy is no more listed. I also saw the name Andrew Hislop living at 83 De l'église in Ville St-Laurent but nothing was said to link him to the Monkland Dairy.